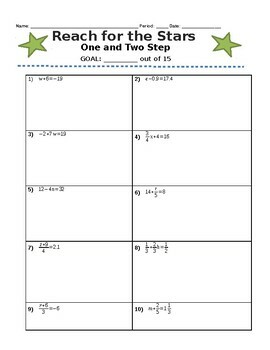 This activity is very useful for students to practice the specific skill and also for you to gain understanding on their progress. Students work on the problems, and the instructor walks around to check work. When students get the correct answer, they get a star. You can simply just draw a star with a colored pen, or can actually give out a star. When student answers are incorrect, they work more on the problems to find their error and get to the correct answer! During this activity, I set a goal with the class. For example, if the goal is 10 out of 15, if they earn 10 stars they get a reward, or even 100 for the day in the class.